Psychometrically defined analogue populations and inpatient psychiatric samples were used to examine (a) the hypothesis that positive and negative self-statements and the balance between positive and negative self-talk are differentially associated with psychopathology, and (b) the merits of a revised ATQ. Two studies involved completion of an extended self-statement inventory that included the Automatic Thoughts Questionnaire (ATQ) and some positive and neutral items. Subjects indicated the frequency of particular cognitions and rated each for degree of positive or negative valence. Study 1 used psychometrically defined groups—dysphoric, overly optimistic, and normal. Positive items that discriminated groups were tested in a cross-validation sample. Study 2 incorporated a Depressed inpatient group and an Other Psychiatric Disorder inpatient comparison group. Regression analysis showed that the addition of 10 positive items to the 30-item ATQ significantly increased the amount of variance accounted for, using diagnostic group as the criterion. 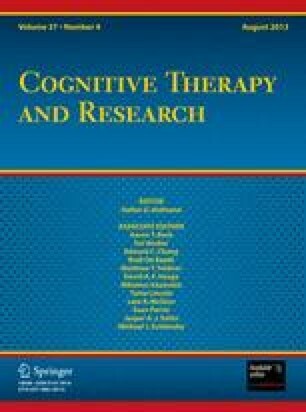 Dysphoric/depressed groups endorsed significantly more negative self-talk and evidenced a significantly less-frequent occurrence of positive self-talk than normals or overly optimistic subjects (Study 1) or than the inpatient psychiatric group with other diagnoses (Study 2). Valence did not account for additional variance. The obtained proportions of positive and negative self-referent speech supported the notion that a psychologically healthy internal dialogue is a 1.6:1.0 (.62 to .38) ratio of positive and negative thinking. Discussion includes consideration of the role of negative and positive self-statements in depression, the notion of optimally balanced self-talk, and the recommendation to use the ATQ-R for future research.